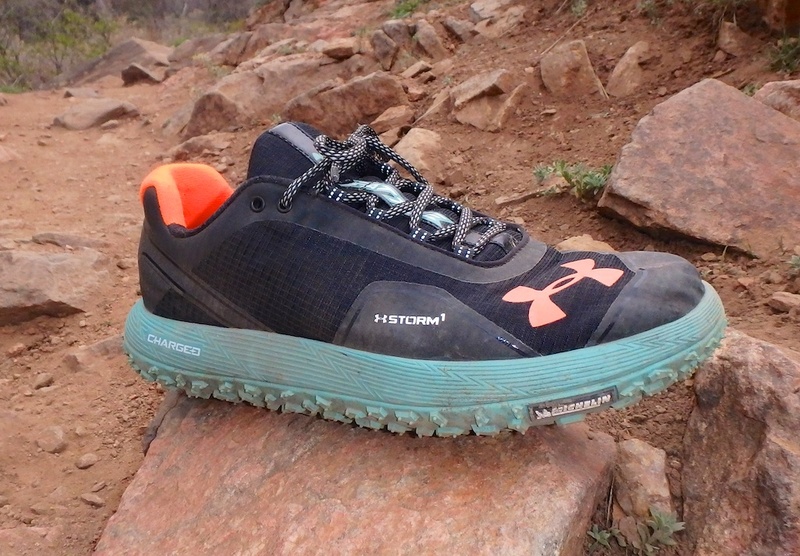 Running, hiking or stomping through a slushy puddle, a new kind of shoe from Under Armour is designed to replicate the go-anywhere versatility of fat bikes. Make no mistake — this is one crazy shoe. In testing, it has garnered me more comments than any other single item of outdoor equipment with the possible exception of the Osbe Proton ski helmet. I’ll admit to being very skeptical of the design; do runners really need “fat tires” for their feet? Yet the shoes are being built and marketed by one of the largest brands in the athletics world, so I strapped on the fatties and headed into the mountains to give them a fair test. First Impressions: Big fat sea-foam green soles made in partnership with tire manufacturer Michelin highlight a black and orange upper. To put it lightly, these things make a statement. Slip them on your feet, and things don’t get any less strange. The fit is nice, and the upper slips on well. But take a step and WHOA! Are you walking on a balloon? You will put them on and want to bounce around and jump from foot to foot. Moon Boots? People will ask if you’re wearing moon boots. They will think they are clever, but you will know otherwise. If you are OK with this, read on. How To Test: The hardest thing with these shoes is figuring out what they are for. They don’t fit into any of the traditional categories of footwear, and to compare them to a bike tire is just silly. So, I took them camping. I tromped through a burning campfire. I wore them hiking in to a fishing spot. I even wore them shoveling composted horse manure into the back of my pickup truck. 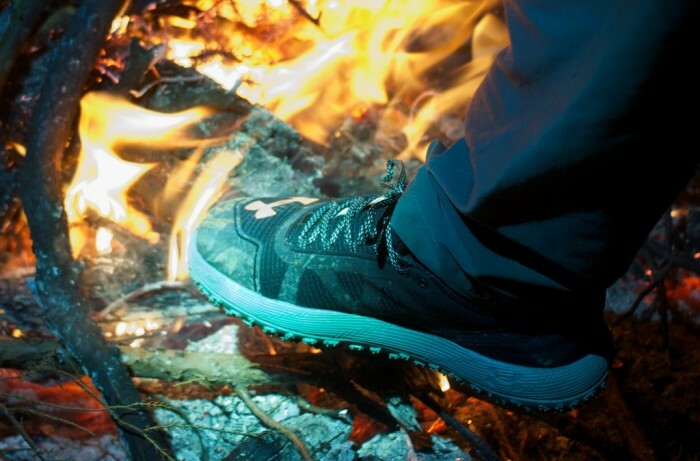 Fattin’ Around The Camp: For casual mountain camp use, these are some pretty fun shoes. They are comfortable to stand in, have great traction and protect feet well from rocky ground. They also seem at least a little flame resistant. I stomped over a campfire a few times to see how that worked. So far, A-OK, although I don’t recommend them for any application in which fire retardant certifications are needed. For running? This was my biggest doubt about the shoes. Currently training for the Grand Canyon 100, I’ve been putting down some serious miles, so I strapped them on and headed to the only place I could see these working. Chimney Gulch in Golden, Colo., is a steep, rocky, out-and-back that climbs 1,100 feet in just two miles. I’ll admit, the Fat Tire was an OK running shoe. Climbing the gulch, traction was excellent and my feet felt well protected. On descent, the shoes cushioned my foot well. The fit was secure and I ran a confident lap, but definitely not one of my fastest. But really, these aren’t running shoes. It feels kind of like running on balloons; proprioception is non-existent and foot muscles seem disengaged. The mushy, bouncy sole seems to sap a lot of energy, making the shoe pretty inefficient. Verdict? 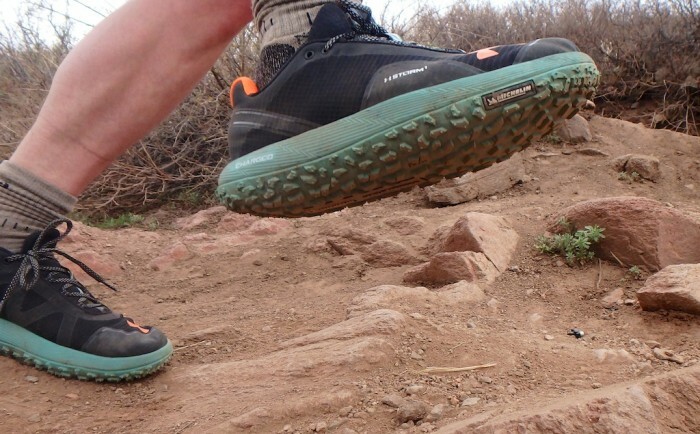 You can run in the Fat Tire, and for short runs across crazy rough terrain it would be fun, but no serious runner is going to use these for racing or even much training. Weight: The pair I’m testing weighed in at 13.4 ounces per shoe at a size 9. That is heavier than any running shoe in my quiver. 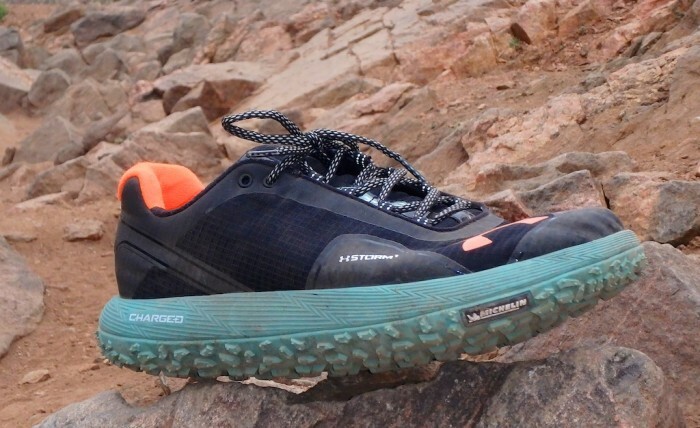 For a hiking shoe, it’s not too bad. The weight is actually lighter than you’d expect given the huge soles. Traction: Under Armour worked with Michelin to create the WildGripper sole, and it’s great. The shoes gripped well on everything from mud to rock. Warmth: This is a cool weather shoe. Running in 50 degree weather my feet got hot quickly. Camping in 30 degree weather, they were very comfortable. 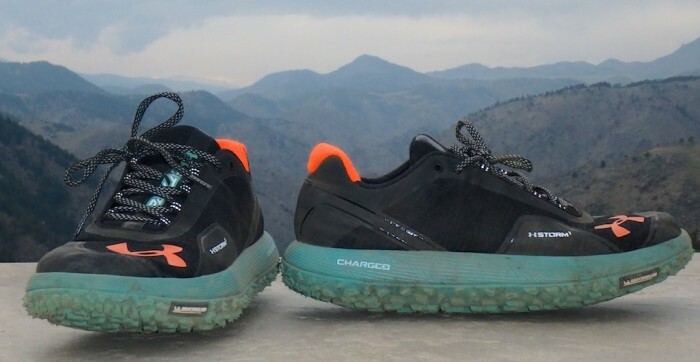 Materials: The thick sole is made of “Charged Cushioning,” bottom-loaded with a soft, high-rebound foam that allows the shoe to mold to the terrain. 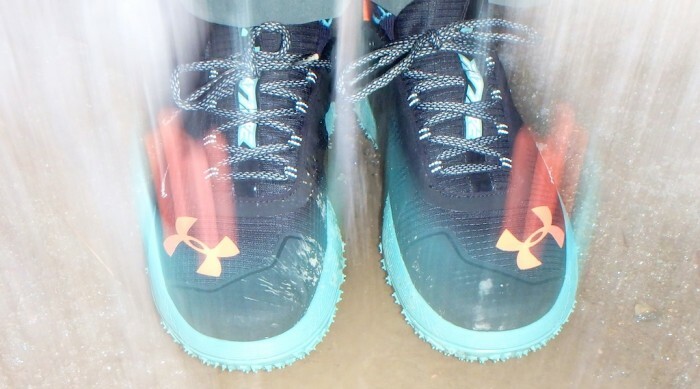 The upper is made with Under Armour’s proprietary Storm1 textile with abrasion resistant panels. It’s a tight mesh that seems fairly breathable yet warm. Not Waterproof: I was unsure about the water resistance, so I stopped and put my foot in a stream. FYI, they aren’t waterproof. Who’s It For: The Fat Tire Low Tops are a comfortable shoe, but do they do anything better than a more conventional model? In my initial assessment, I’d have to say not really. 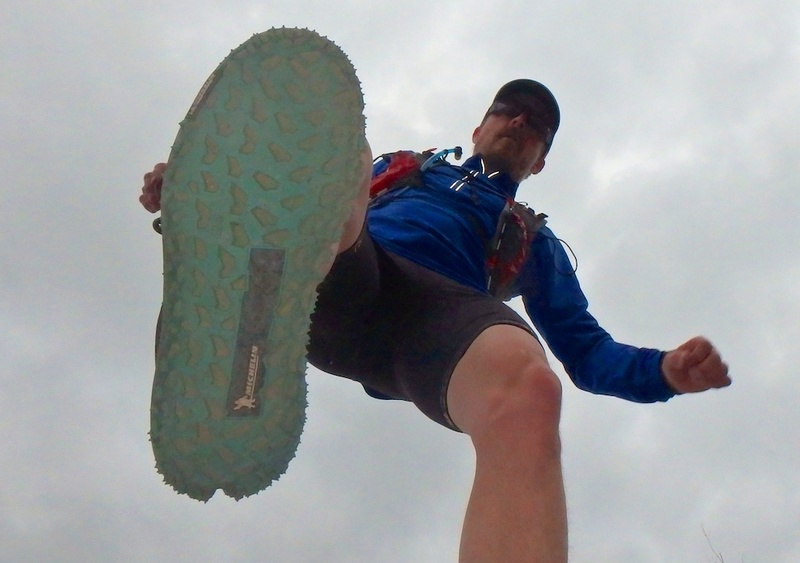 Many dedicated trail running shoes will serve you better for everything from light hiking to trail running. That said, I have a feeling these nutty shoes are going to be popular. They are comfortable. They keep feet warm and protected. More than anything, they stand out from the crowd. 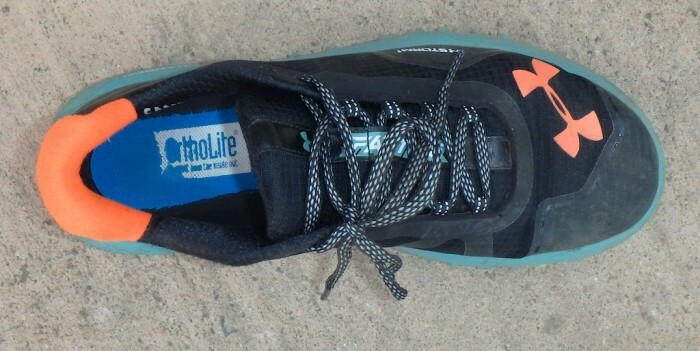 This is a shoe for general outdoors walking around, for use in cities and towns during nasty fall and winter weather, short hikes on rugged trails, fishing river banks and just being outside. Killer! Running over sharp rocks and hard ground, you hardly feel the surface. Stomp all you want, your feet are super cushy! Flaw: Walking or running in these shoes is pretty weird. It feels a lot like being on a bouncer used at a kids’ birthday party, without all the rebound. 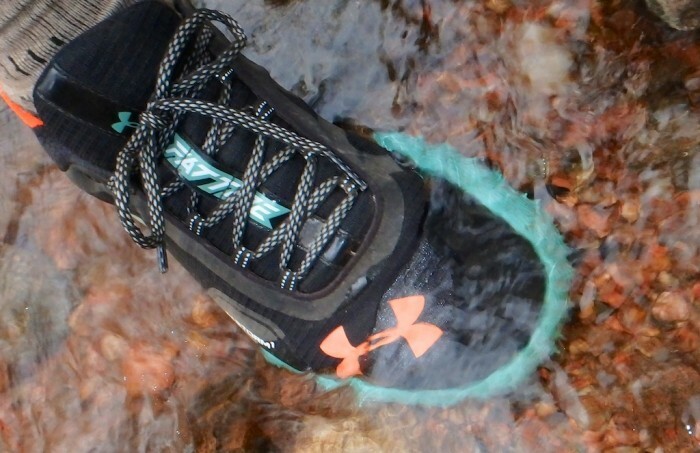 You can feel air, or maybe foam, moving around under your foot sort of like having a shoe full of water. Who Should Buy It: People looking for a general use outdoors shoe for camping, fishing from riverbanks or running around on scree fields. They are very protective to the sole of your foot, so they may be helpful for people with sensitive feet or arthritis. Pavement and trail running shoes.